PLEASE guv, I was only there for a minute – can’t you let me off, just this once. Parking chiefs have heard every excuse a million times but they were frantically checking their own records this week to see whether there were any possible grounds for appeal in a particularly sensitive case. As this picture shows, the Town Hall’s own parking enforcement car appears to have been caught out slap bang on the middle of two fat yellow lines. 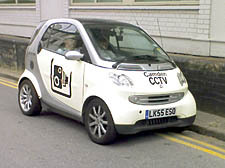 The Smart car, which zips around the borough filming motorists making mistakes and parking in the wrong places, was spotted in College Crescent, Swiss Cottage, on May 14. Camden has checked the authenticity of the photograph and said it is now the subject of an internal inquiry. Enforcement teams will have to explain why the car stopped there and what staff were doing inside. A spokesman said disciplinary action would be taken if necessary. The picture was captured and sent to the New Journal by a passing driver – who just moments before taking the photo had been stung with a £40 penalty by wardens for overstaying in a residents’ bay for just four minutes. The photographer said: “I drove up the road looking for somewhere to park. As I passed them, I remember thinking it would be nice if I could park like that. A Camden press official said: “Our drivers have strict instructions that they should only park on double yellows when it is both necessary and safe for them do so. “We expect the highest standard of conduct from our staff and contractors.